It seems like a cruel twist of fate. The three African countries where the Ebola virus has rapidly spread and caused over 1 300 deaths since January – namely Guinea, Liberia and Sierra Leone – have all been emerging from protracted periods of crisis and war. And now this. The outbreak, which started in Guinea in December last year, has led to untold suffering in countries that have seen more than their fair share of hardship. Apart from the toll on individuals and families who have contracted the virus, citizens who have not been directly affected by the disease also risk being stigmatised on their own continent. Several countries have closed their borders to Guinea, Sierra Leone and Liberia, and a number of others, including Zambia and Kenya, have banned flights coming from these West African states. This week, 7 000 Guinean pilgrims to Mecca were turned away because of fears that they would spread the disease. This is devastating for those who had saved up for years to make the all-important trip. Travellers from Nigeria, where 12 cases have so far been reported, have also been refused visas to travel to various countries. Guinea, Liberia and Sierra Leone all figure in the top 50 states in the Fund for Peace Fragile State Index, which surveys 178 countries around the world according to a range of social, economic and political indicators. Guinea is in 12th place, Liberia in 24th and Sierra Leone 35th on the list, which was released in June this year. Somalia, for the first time in several years, dropped from the top position as the most fragile country in the world to be replaced by South Sudan. The three Ebola-struck countries are also included in the list of 26 ‘more fragile’ African states that were identified by the Institute for Security Studies’ (ISS) African Futures Project in a recent publication on state fragility in Africa. The question can now be asked how countries will cope to recover from this setback and whether the state and institutions, which have desperately failed their citizens, will be resilient enough to save these countries from regressing. Will they be able to bounce back after Ebola? Ironically, Guinea, Liberia and Sierra Leone are some of the most resource-rich countries on the continent, with ample reserves of gold, diamonds and iron ore; huge wood and rubber plantations; and abundant potential for hydro-electric power generation. Guinea, for example, has a third of the world’s bauxite reserves. War, political strife and economic mismanagement have, however, led to mass-scale destruction of infrastructure – stifling economic development and leading the most educated of the population to find solace elsewhere. Greg Mills, Director of the Johannesburg-based Brenthurst Foundation, lists these failures in his newly published book, Why states recover – a look at what the international community, but also locals, can do to help recovery in countries as diverse as Afghanistan, Malawi, Kosovo and Zimbabwe. In his book, Mills indicates that every country has its own specific challenges as well as positive characteristics that can be leveraged for recovery. Only in 2010 did Guinea, for example, manage to emerge from decades of political stagnation and a series of coup d’états under its first president, Sékou Touré, and his successor, Lansana Conté. The state has vast mineral resources that could be mobilised in ‘mega-projects,’ which could employ thousands of people, writes Mills. The current government, however, has made some disastrous economic decisions and is constantly at loggerheads with mining companies. President Alpha Condé is also accused of vote rigging, and has not been successful in managing the fragile ethnic balance in the country. In Liberia, President Ellen Johnson-Sirleaf has been successful in getting the country’s debt cancelled and attracting much-needed foreign direct investment. However, Mills says ‘software issues’ like a low literacy rate, corruption and a tendency to depend on international aid are hampering the process. The way the Ebola crisis has been managed, along with some resistance to modern healthcare due to ignorance about the disease, bears this out. 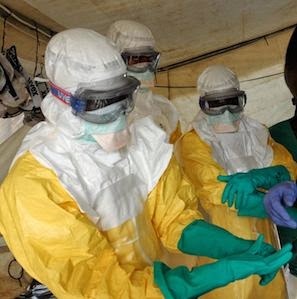 Regional leaders who met in Ghana in early July also pointed out that, in some parts, cultural beliefs and a lack of communication about the epidemic have seriously affected the spread of the disease and obstructed relief efforts. In Sierra Leone, the United Nations (UN) closed its office on 31 March this year after 15 years in the country. The government has also launched impressive plans to propel the country to middle-income status in the next 25 years. Analysts, however, disagree over the extent of international intervention that would be needed to reach this goal. Some opt for sustained intervention to rebuild institutions, while others, like Mills, insist that the initiative should come from local politicians, civil servants and ordinary citizens eager to rebuild their country. Jakkie Ciliers, the Executive Director of the ISS, and Timothy Sisk, a professor at the University of Denver, believe that international financial institutions have a crucial role to play in supporting the reconstruction of fragile states. Interventions like the Extractive Industries Transparency Initiative can also help to force governments and private companies to cease the selfish exploitation of resources that benefit only a small elite. ‘Fortunately, state fragility is not cast in stone. With the necessary domestic ownership, leadership and external support, more countries can move from being more fragile towards greater resilience,’ they write in their study on more fragile states. Indications at this stage, in any case, show that Ebola has again put the spotlight on these fragile countries and international humanitarian organisations like Doctors Without Borders and the World Health Organisation are mobilised to prop up the failing local health systems. Getting rid of the stigma of being Ebola-ridden will take a long time, not only for West Africa, but also for the entire continent. It took years, if not decades, for the world to stop focusing on the HIV/Aids epidemic – even though the virus still has devastating consequences. According to Cilliers and Sisk, emerging from fragility is definitely a long-term project. Of their 26 countries identified as ‘more fragile,’ Guinea falls in the more positive group. With the correct interventions, it could be lifted out of fragility as early as 2030. For Sierra Leone and Liberia, it could take another two or even three decades before they can shake off the label of fragility, the researchers say. It is hoped that the Ebola outbreak will, in fact, be merely a temporary setback and a passing phase in this long-term trajectory.